Discussion in my Nonfiction Book Group went really well last evening. Lots of animated opinions on many of the main theories in the book. In the end, the main theme is there's always potential to change. There are certain patterns to life, but being aware is being forearmed. Knowing what's going on gives you a leg up and the ability to decide "yes, I'll follow the trend," or "no, I won't." Encouraging, really. Gladwell presents loads of statistics on why things happen the way they do, why and when things seem to multiply "virally," to use the internet term, and how in some ways society's manipulated (for better and worse) by those who have the information, connections and salesmanship to influence what's popular and what isn't, etc. Trends reach a certain tipping point, then something happens to push them over. Statistically speaking, this can be quantified, and Gladwell presents lots of examples to back up his research. Interesting stuff. Now that we've discussed it I want to go back and read the book through again. That always happens, and I never quite find the time with so many other books waiting in the wings. Maybe I'll check out the book on CD, just to hit the highlights one more time. 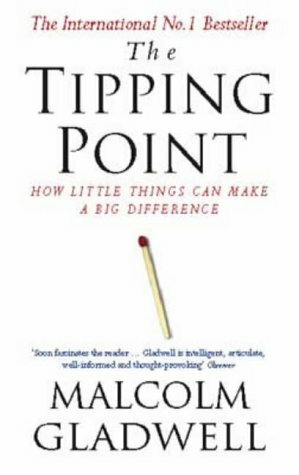 But a definite recommendation for The Tipping Point. I can all but guarantee once you've read it you won't see life the same way ever again. Previous Post In which Lisa melts into a puddle on the floor.